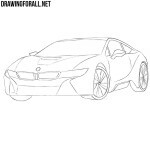 As you already guessed from the title, this lesson will be devoted to how to draw a BMW M4. Those who are well versed in cars know that BMW M4 is a sports version of the 4-series coupe of BMW. This is a very fast and cool car, and today we will learn how to draw it. 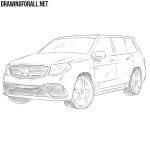 Drawing a car starts with drawing its body. Thus, we sketch out the outlines of the body with very light lines. Try to repeat the outline as in our example. When you draw the body, take into account the perspective, that is, the front part of the car should seem bigger than the rear. In the front part sketch out the outline of the radiator grille (which in the future we will divide into two characteristic “nostrils”) and angular headlights. 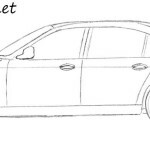 On the side of the body of our BMW sketch out the outlines of the wheels and rear-view mirrors. Now, by tradition, we will start working with the details, and also by tradition we will start from the front. Draw out a characteristic radiator grille, divided into two parts. Next outline the wide and angular headlights. Do not forget to draw out the details in the headlights and lines of the radiator grille. Carefully draw the curved hood of our BMW M4. 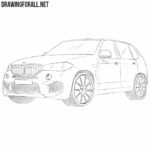 Do not forget to draw a hood lines and a round BMW logo. A little below the headlights carefully draw out the outlines of the bumper parts. Now let’s move a little higher and continuing the hood lines draw out the contours of the low roof of our BMW car. Draw the outlines of the windows (do not forget that the BMW M4 has one door on each side) and a rear-view mirrors. Now we need to draw the side part of our car. Draw out the lines of the door, the handle and the visible part of the back of our BMW. By the way, do not forget to erase all the unnecessary lines that we drew in the first two steps. Now we are start a very difficult step – we will need to draw out the wheels and wheel arches here. You need to try to make the wheels rounded and smooth. At the end of the step we erase all unnecessary guidelines from the body of the BMW M4. Note that the BMW M4 has wide enough wheels. No less difficult step, in which we will need to draw out the rims. You can repeat the outlines of the rims as in this example or come up with your own design of the rims. To give your car a cool look draw large rims and low profile tires. To make our BMW M4 look not flat and unnatural, add some glare and shadows. Draw glare on the windows with light lines. Next, draw the shadows with light hatching, adding them to the least lit areas. In the same step we draw the texture of the lower grille using cross lines. The lesson about how to draw a BMW M4 was quite complicated, but it seems to us that the result was worth the effort. So, if you did everything right, then you now have your own BMW M4, but there are no headaches with repairs, car insurance, etc., since your BMW is drawn on a paper. If this lesson was cool, then support us on Patreon, subscribe to us in Pinterest, Facebook and other social networks.